Background music in business is booming. 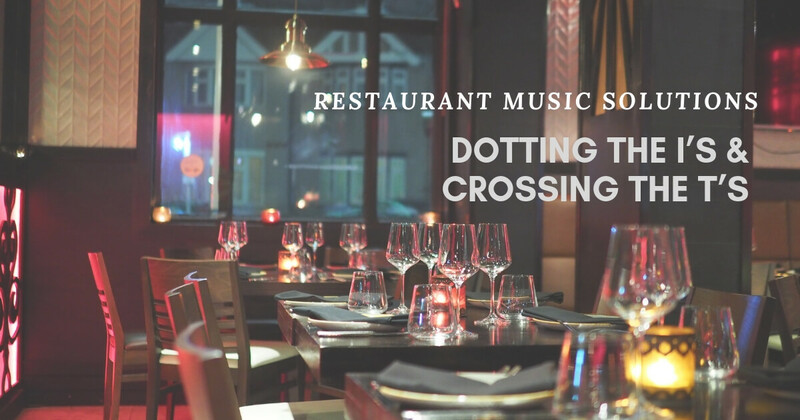 There are now various offerings of restaurant music solutions from companies with the software and approved music databases to tailor playlists and schedule them to a company’s commercial tastes. Until relatively recent times, in store music has been an area of difficulty for businesses as voluminous as McDonalds for example. A large reason for the explosion of supply and demand in background music can be attributed to legal necessity. A very important consideration for any business in an age of digital proliferation is to be able to discern and understand what represents a legal soundtrack. Here to help guide you through the choppy waters of legal music licensing are a series of points to be aware of when plotting the soundtrack for your restaurant. I play Spotify and iTunes playlists on my premises. Can’t I just play these without a licence? This is the most common misstep made by businesses of all sizes. iTunes and Spotify are clearly marked for personal consumption only. They do not have the licenses to provide music to be played in a public environment, whether that’s an office, bar, restaurant or garage. Can you really take your chances, simply play what you want using your own customised playlist and pay nothing? The point to take away here is the risk far outweighs the benefit – the cost if you are a business that gets caught is severe. in 2015 a North London socialite bar in Muswell Hill was ordered to pay PPL £19,000 for free use of commercial music. Beyond this the owner would have had to complete a jail term if they continued to play licensed music freely. This applies even if you have a sole employee and work from a home office. In 2018, evading this could be a business ending move. I bought what’s on the playlist, doesn’t this mean I own the music? This counts as you buying the music as an individual for personal use. Using it in the context of your business is a different story. Playing background music in your restaurant, bar or hotel is considered a public performance of that material. UK rights organisations PRS and PPL recently merged to create PRS PPL Ltd, to administer the licensing of music used in public, which is defined as “public performance”. This is the first port of call for your licensing enquiries, and up until this year has been a regular source of contention for owners of one license and not the other. Prior to 2018, business owners required a PRS license to cover the copyright of the musical and lyrical composition, and a PPL license for copyright in the sound recording. It pays to do your research into both organisations. What about TV and Radio; I pay a TV licence; doesn’t this cover me? Again, this isn’t the case. Your TV licence allows you to receive the broadcast signal for your television. As with buying the music on a playlist, this is fine on an individual basis, in your own home – take it out into your restaurant and you will have to pay the joint licence. It’s the music contained in the TV programs and radio shows that counts as public performance once more, and this even covers opening and closing titles, idents and advertisements. Pretty much every aspect of commercial music usage you can imagine in a modern business needs covering by this licence. The same applies regardless of device the music is played through, be it a smartphone, iPod or digital radio. This extends as far as being aware of the commercial aspect of any telephone hold music you use – technically, this is material being played for your customers and therefore again represents public performance. What could I play outside of acquiring this joint licence? With all of this taken into consideration, not a great deal. You can play music not licensed under these bodies that falls under the “copyright-free” or “royalty-free” description. Additionally, music where the period of copyright protection has expired for both the song and its recording. not being able to play any recognisable music is a position that will hamper your performance and almost certainly weaken the ambience of your premises in comparison to local competitors. For all of these reasons, more than ever before, businesses need to research into and be aware of why sourcing music legally is an absolute necessity in the digital age. make sure you and your restaurant are proactive in the face of this for the sake of your premises and the artists helping you to achieve your profit margins. So where should I get my music? US Top 100 Billboard charts, since the charts began back in 1952. You can also download the tracks you want. Plus these are fully licensed for business use and it’s cheaper than iTunes!